The oak tree was so old that George Washington is said to have picnicked under it during the American Revolution. Roseanne Colletti reports. It stands about 100 feet tall, has a trunk circumference of 18 feet and has a branch spread of roughly 150 feet. For hundreds of years, an imposing white oak tree has watched over a New Jersey community and a church, providing protection from the blazing summer sun, serving as a scenic backdrop for thousands of photos and — according to legend — was a picnic site for George Washington. But on Monday, the tree — believed to be among the oldest in the nation — took its final bow in the church graveyard that it's called home for 600 years. It was declared dead after showing rot and weakness over the last couple of years, and authorities opted to cut it down. 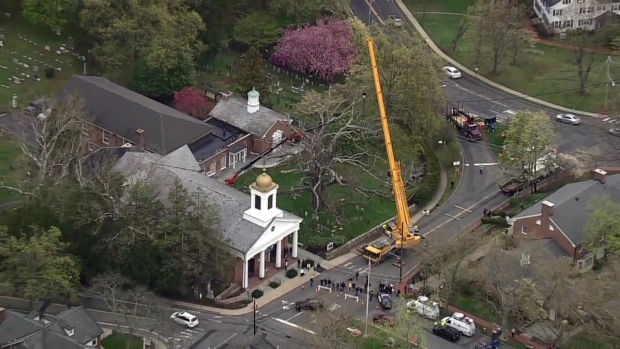 Chopper 4 was over the scene Monday morning as crews began removing the relic outside the Basking Ridge Presbyterian Church. A huge yellow crane was seen towering over the tree as a helmat-clad worker moved about its centuries-old limbs. It's expected to take two or three days to remove the entire tree from the bedroom community about 30 miles west of New York, which has long celebrated its white oak. It's been the place to go for formal photos, a landmark for driving directions and a remarkable piece of natural history. "I know it seems funny to some to mourn a tree, but I'm really going to miss seeing it," said Bernards resident Monica Evans, recalling family photos during weddings and communions. Chopper 4 was over the scene as crews began taking down the relic Monday. A huge yellow crane was seen towering over the tree as a worker in a hard hat moved about its centuries-old limbs. Arborists say the tree had stood for nearly 300 years before the church was built in 1717. It stands about 100 feet tall, has a trunk circumference of 18 feet and has a branch spread of roughly 150 feet. 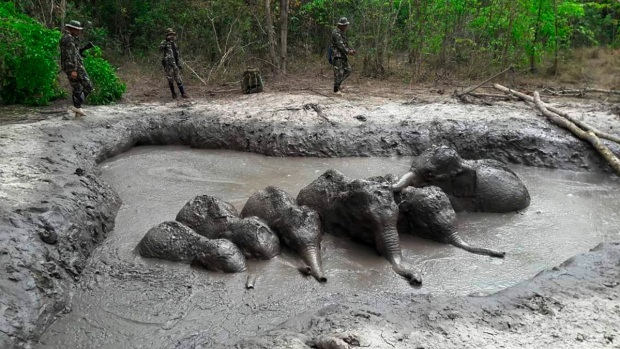 Its death was likely due to its age. Arborists determined it wouldn't be able to withstand many more harsh winters or spring storms. "It has been an integral part of the town, that's for sure," said Jon Klippel, a member of the church's planning council. "It has always been there, even before there was a town, and over the years many people have met there, been photographed there, had a meal under the tree. We've been blessed to have it here." But there is a silver lining for tree fans: Another white oak cultivated from the old tree's acorns was recently planted at the church, so its legacy will continue at the church. The old tree's removal is a reminder of how older trees are starting to become less common across the nation. Experts say fewer trees are replicating the old oak's 600-year lifespan. They note that several factors — including droughts, intensive wildfires and invasive insects — can greatly harm trees, which become more susceptible to damage as they age.